“Taming Tiger with String of Beads” demonstrated by Sifu Eugene here is an excellent way to counter any kicks! There are many effective Shaolin counters against Taekwondo kicks. “Tame Tiger with String of Beads” can be used to counter any kicks. “Two Tigers Subdue Dragon” is excellent to trap the leg of a side-kick. When an opponent executes a reverse round-house, you can apply “Double Dragons Cross Step” to strike him often without him knowing how. 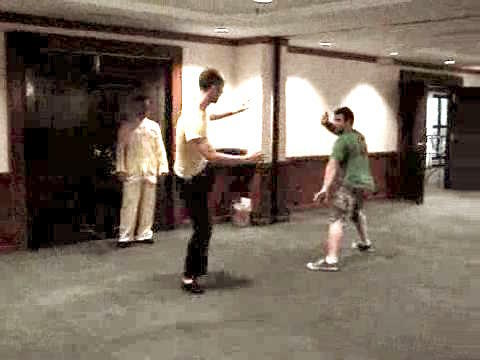 Innes executes a low kick, a high kick and a middle kick at Sifu Eugene. Grandmaster Wong shows Sifu Eugene how to trap Innes' leg using “Two Tigers Subdue Dragon” after dodging the first two kicks. Notice that instead of moving his feet back, Grandmaster Wong sinks back his body to “swallow” the middle kick. After dodging the first two kicks, this time Sifu Eugene uses a different technique to counter Innes' third kick. He brushes the kicking leg away and moves in to attack Innes; groin. While it is a good counter, Grandmaster Wong advises that moving in diagonally in this case may be risky. It is better to move back while brushing away the kick, then move in to attack the groin. Innes could not escape because the brushing hand is still controlling the kicking leg. Instead of moving back the front leg to avoid a kick, a good technique is to sink back the body slantingly, using the pattern “Tame Tiger with String of Beads”. This pattern is excellent against any kicks. Then move in swiftly to strike the opponent. Another excellent way to trap an opponent's kicking leg is to use the pattern “Two Tigers Subdue Dragon”. Good body-movement is crucial for a successful application of this pattern. You can also grip the opponent's front hand, which will then render him quite venerable to any of your attacks. Grandmaster Wong shows the finer points of applying “Two Tigers Subdue Dragon” to trap an opponent's kicking leg. He grips the front hand of the opponent, still holding the leg firmly. Then he fells the opponent onto the ground by tripping him. Innes executes a round-house kick, followed by a reverse round-house. Sifu Eugene slants his body backward to avoid the round-house, then moves in swiftly as the opponent executes the reverse round-house, using the pattern “Night Tiger Emerges from Jungle”. 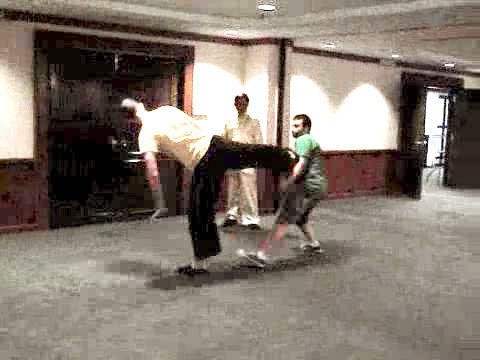 Sifu Eugene uses one hand to control the kicking leg, and the other hand to strike the opponent. Grandmaster Wong demonstrates another effective pattern against the reverse round-house. It is called “Double Dragons Cross Step”, where the opponent is struck often without knowing how. Notice that in the application of this pattern, the exponent follows the momentum of the opponent. Grandmaster Wong used this pattern very often when he sparred with Taekwondo blackbelts in his young days. 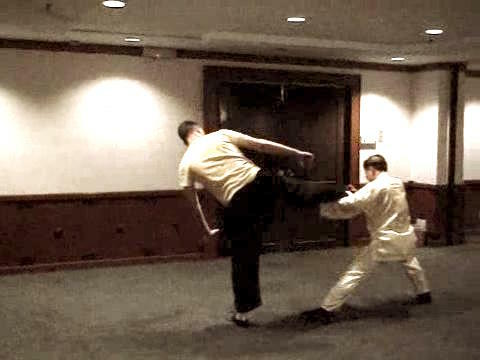 Effective Shaolin Counters against Taekwondo Kicks from Wong Kiew Kit on Vimeo.